Dozens of the centre's members beat the August heat with some ice cream, blueberries and canine companionship. 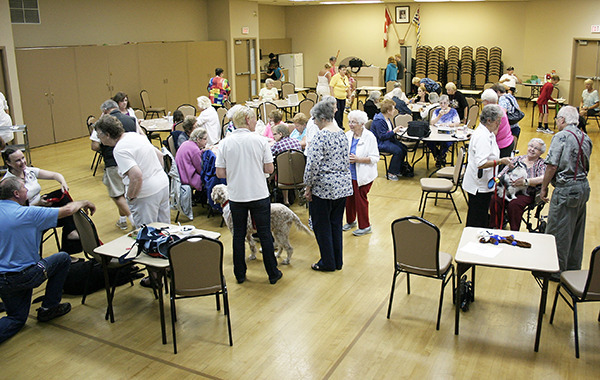 This year, the ‘“dog days of summer” means something a little bit different at the Kennedy Seniors Recreation Centre. 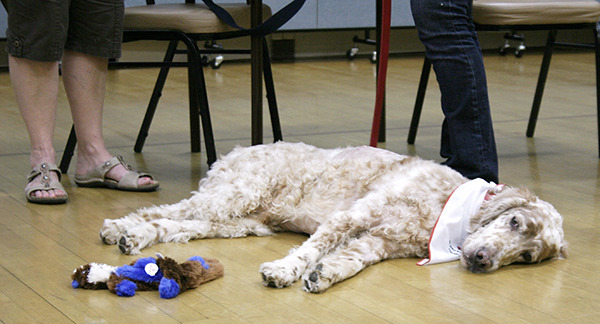 The excitement in the room was palpable as dozens of the centre’s members enjoyed a visit by some four-legged friends courtesy of the St. John Ambulance therapy dog program and BC Guide Dogs on Aug. 10. Laura Saker, social director with the Kennedy House Seniors Society (the volunteer-based group that runs the centre), said the event was intended to get seniors out of the heat and into the air-conditioned centre. Saker said the event was part of an ongoing effort to shake things up at the centre and encourage seniors to come in and not only beat the heat, but interact and socialize. Saker said the visit from the dogs did just that. “A lot of them had dogs [but] can’t have dogs anymore. They love getting their hands on them, so this was the perfect opportunity to do that,” she said. Susie Ward of BC Guide Dogs, who was accompanied by a five-month-old black Labrador retriever named Pebbles, said events like this are an important part of training for both the dogs and their handlers. Gerry Redmond is a member of the centre and the co-facilitator for the therapy dog program at St. John Ambulance’s Surrey/Delta/Langley branch. She said the unconditional love that dogs like her eight-year-old Japanese chin/shih tzu-cross Bailey (full name Bailey Anderson Cooper Nelson Redmond) provide adds a much-needed dose of positivity to a lot of people’s lives. As for the Dog Days of Summer event, Saker said it was a big success. Although there are currently no plans to bring the dogs back before next summer, that hasn’t stopped enthusiastic members from enquiring. “People keep asking, ‘when are the dogs coming back?’” Saker said.